As a water skipper glides across a summer still pond, teeming beneath it's surface, held aloft by the surface tension, so this beautiful novel gracefully moves across the life of Lucy Barton, gradually testing it's depths. Lucy is a young woman living in NYC during the 1980s, married with two beloved young daughters, yet in virtual exile from her home in the rural Midwest. She is confined to a solitary hospital room for over two months with an unidentifiable infection. One day she wakes to find her estranged mother sitting at he foot of her bed. There is a sweet bravery in her mothers presence and in her gently squeezing Lucy's toes and using her childhood name "Wizzle". The hesitant give and take inevitably deepens into the tension beneath the surface. It is at times sad, but never ugly; and always riveting. As a water skipper glides across the still surface of a teeming summer pond, so this beautiful novel gracefully moves across the life of Lucy Barton, gradually testing its depths. Lucy is a young woman living in NYC during the 1980s, married with two beloved young daughters, yet in virtual exile from her home in the rural Midwest. She is confined to a solitary hospital room for over two months with an unidentifiable infection. One day she wakes to find her estranged mother sitting at he foot of her bed. There is a sweet bravery in her mother's presence and, in her gently squeezing Lucy's toes and using her childhood name: "Wizzle". The hesitant give-and-take inevitably deepens into the tension beneath the surface. It is at times sad, but never ugly; and always riveting. A new book by Pulitzer Prize winner Elizabeth Strout is cause for celebration. Her bestselling novels, including "Olive Kitteridge "and" The Burgess Boys, "have illuminated our most tender relationships. Now, in "My Name Is Lucy Barton, "this extraordinary writer shows how a simple hospital visit becomes a portal to the most tender relationship of all the one between mother and daughter. Lucy Barton is recovering slowly from what should have been a simple operation. Her mother, to whom she hasn t spoken for many years, comes to see her. Gentle gossip about people from Lucy's childhood in Amgash, Illinois, seems to reconnect them, but just below the surface lie the tension and longing that have informed every aspect of Lucy's life: her escape from her troubled family, her desire to become a writer, her marriage, her love for her two daughters. Knitting this powerful narrative together is the brilliant storytelling voice of Lucy herself: keenly observant, deeply human, and truly unforgettable. Strout has a magnificent gift for humanizing characters. " San Francisco Chronicle"
What truly makes Strout exceptional . . . is the perfect balance she achieves between the tides of story and depths of feeling. " 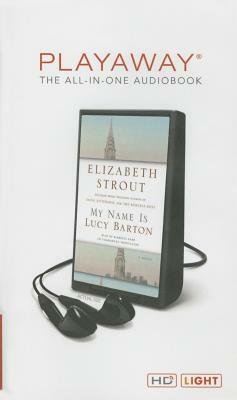 Chicago Tribune"
Strout] constructs her stories with rich irony and moments of genuine surprise and intense emotion. " USA Today"
Strout animates the ordinary with an astonishing force. " The New Yorker"
Strout s] themes are how incompletely we know one another, how desperately hard every person in the world is] working to get what they need, and the redemptive power in little things a shared memory, a shock of tulips. "People. Elizabeth Strout is the Pulitzer Prize winning author of "Olive Kitteridge, "as well as "The Burgess Boys, " a "New York Times" bestseller; "Abide with Me, "a national bestseller and Book Sense pick; and "Amy and Isabelle, " which won the "Los Angeles Times" Art Seidenbaum Award for First Fiction and the "Chicago Tribune" Heartland Prize. She has also been a finalist for the PEN/Faulkner Award and the Orange Prize in England. Her short stories have been published in a number of magazines, including "The New Yorker and O: The Oprah Magazine." Elizabeth Strout lives in New York City. "From the Hardcover edition.""